Imagine that you have been researching, studying and hunting for the dog of your dreams. You have had the idea of getting a dog for a while but the final decision happened on a whim. Today someone brought a dog into work and it made you realize how much you wanted a new friend in your life. The time is right and you want it NOW. As soon as you get home you jump on the internet and after some time, you finally decide on the right breed for you. You do a search for breeders in your state and one comes up nearby. You get so excited thinking that maybe by the end of the week you will have a new puppy on the way. You click on their information but it just takes you to yellow pages. There is a phone number so you go to call but then realize that it is 11:00 pm and you will have to wait until tomorrow after work. You write down the number even though you really just wanted to see pictures of their dogs, check if the price is in your budget, and to see if they had an upcoming litter. You disappointingly go back to your search and notice that there is another breeder listed so you click on the link. It takes you to a website and the first thing you see is a clear and crisp photo of the dog of your dreams standing next to the most adorable puppy you have laid eyes on. You notice the banner running across the top of the page saying puppies now available, CLICK HERE. You click the banner and it takes you to a page with pictures of the available puppies and detailed descriptions with pricing. You hit the contact now button at the bottom of the page and send them an email requesting the puppy you had been looking for. The first breeder in this story lost business in less than two minutes. The second breeder immediately gained credibility and made a sale without even knowing it happened. If you are just starting your breeding business or are looking to increase your business then take a look at these top reason having a professional website is not only extremely convenient but in today’s society, undeniably necessary. the customers exact words in a quote. 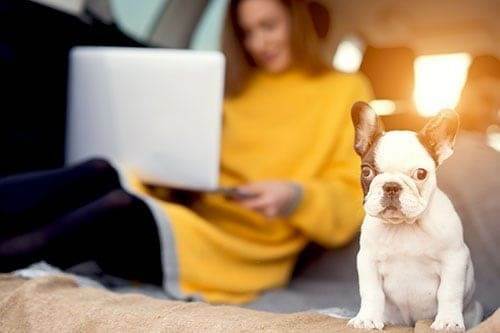 Travel is not an uncommon practice when it comes to the purchase and pick-up of a puppy. Having a professional website helps expand your market and makes connections across the country which can open up your business to many new customers. Social media is the way people connect right now, and any form of social media can direct people right to your website. Social media is a simple and easy way to market your business but without a professional website, you have no place to send your new connections. Having a professional website enables you to screen and choose your customers more diligently. You can have new owner applications and require a form be filled out to get to know potential customers before you even speak to them. Not only does this help ensure your puppies go to good homes, it can also help prevent having to deal with difficult customers. If you are a high-quality breeder you do not want your bloodline in the hands of just anyone. The homes your dogs go to have an effect on the dog’s future and in turn on your business reputation. Your professional website is running your business while you are enjoying your life. It is always available to your customers and is keeping them on the hook with pictures, information, and busy work such as reading your blog or filling out your forms. Having a professional website means you are providing information 24-7. When people get in the heat of the moment they typically want answers at that moment. You are basically handing your potentials over to your competition on a silver platter when you do not provide easy to find and immediate answers. People who are searching for a lifetime companion are looking to work with a professional expert on the subject. They want someone with knowledge not only on breeding dogs but on the business itself. A professional website will immediately show knowledge and professionalism, while not having a website at all damages that first impression. There are many marketing tactics all which have individual growth benefits for your business. When you have a professional website you also get a marketing expansion. Building an online presence is one of the main ways to market. Having a website makes it easier for people to find you and gives them the immediate information they are seeking. Having a website redirects the sales part of owning a business and avoids the much-dreaded sales-pitchy conversations so many people hate having. When you have a professional website not only does it market and sell for you, it gives customers the uncomfortable information in a confident manner. Prices and policy are subjects that people often avoid discussing, but having a website gives you the option to direct people elsewhere for further information. Chances are by the time they are calling you they have most of the information they need and are now wanting to secure the sale. I, personally, have made decisions not to work with companies based on the fact that they do not have a website and I know I am not the only one. Having a professional breeder website created just for you will reduce your workload and can articulate your message in a professional and impacting manner. Because of these reasons, investing in a professional website is one of the most beneficial investments you can make in your business-owning career.